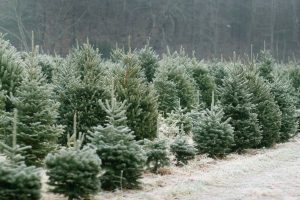 New Haven and Middlesex Counties, Connecticut Christmas Tree Farms: choose-and-cut Christmas trees, Tree lots with pre-cut trees, stands, sleigh rides, hay rides and related winter events and fun! Whether you want to cut your own tree, pick a live tree and have it cut for you, buy a tree already cut or buy a living tree you can plant, this page provides detailed listings of New Haven and Middlesex Counties, Connecticut's choose-and-cut Christmas tree farms, places to buy pre-cut (also called pre-harvested and fresh-cut) trees, stands, sleigh rides, hay rides and related winter events and fun. Some listings are for tree farms, others are tree lots, and some only offer hay rides, sleigh rides or other winter events. READ EACH LISTING to know what each facility offers. The farms are listed further down this page, so scroll down the page! Since this service is free and open to ALL Christmas tree farms, not just those who belong to an association or pay for an ad, like almost all other websites do, this is the most complete and current listing available! I'm always looking for more to add, and to correct any inaccuracies or errors, so if you encounter any, please email me ! And please tell the farmer you visit in New Haven and Middlesex Counties, Connecticut that you found their farm here! I need the farmers to realize that you found them here so that they will keep their information up to date! East Haddam, Connecticut. Phone: 860-680-5149. Alternate phone: 860-537-8861. Open: Call for dates and availability - it depends upon the weather. There is nothing so enchanting as the sound of sleigh bells and the whisper of runners on fresh snow! Have a Courrier and Ivess experience as you bundle up in your lap robes and hand muffs, and let the sleigh take you from this bustling century to a more tranquil time. Bring your own refreshments to warm your body and spirit. 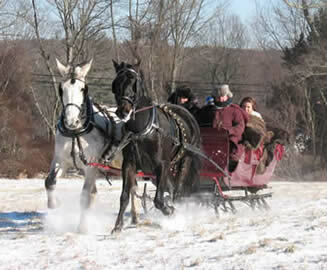 For more information, see these pages: Carriage rides, Hayrides, Sleigh rides , Weddings , Horse-drawn funerals , Movies and props , Carriages . 131 Great Hill Road, Portland, CT 06480. Phone: 860-342-2117. 167 Wopowog Rd, East Hampton, CT 06424. Phone: (860) 267-8880. Email: charliebrownxmastreefarm@hotmail.com. Open: We open the day after Thanksgiving. Open: Click here for current open hours, days and dates. Directions: From Middletown, route 66 to route 16, right at 2nd light, 2 miles down on right. From East Haddam, route 151 to route 196, right on Wopowog Road, 2 miles in on left. From Glastonbury, route 2, exit 13, right on route 66, left at lake on route 196, left in center of town, 4 miles straight on right. FOLLOW OUR SIGNS. Click here for a map and directions. Payment: Cash, Check. Charlie Brown's is a family owned choose and cut Christmas tree farm providing memorable family experiences. We provide quality Christmas trees, hand decorated wreaths, a variety of ornaments as well as offer a warm and toasty log cabin. We open the day after Thanksgiving and are a cash/check only establishment. See their facebook page for dates and times of Santa visits. U-Choose and Cut varieties: Blue Spruce, Douglas Fir, Norway Spruce, White Pine, White Spruce. 67 Kelseytown Road, Clinton, CT 06413. Phone: 860-575-4624. Alternate Phone: 860-664-4609. Email: bdavenport@hpearce.com. Open: Thanksgiving weekend to Christmas. Directions: I-95 to exit 63. Route 81 to Glenwood Road. At third stop sign, turn right. Farm is located approximately 1 mile on the left. Click here for a map and directions. Payment: Cash, Check. You-Choose and You-Cut varieties: Balsam Fir, Blue Spruce, Douglas Fir, Scotch Pine, White Fir (Concolor Fir), White Spruce. 39 Cherry Hill Road, Rockfall, CT 06481. Phone: 860-349-9910. Open: weekends from 10 am to 4:30 pm on weekends between Thanksgiving and Christmas. Directions: Directions to Wadsworth Falls. In 2018, their website says $30 to $50 for trees Payment: Cash or Check. You can cut your own or we'll do it for you. Decorate your own wreath for $15. Crafts and locally made products are also for sale. 69 Kelseytown Road, Clinton, CT 06413. Phone: 860-669-5049. Email: JoAnn@Kelseytown.com. Open: See our website for hours. Click here for current open hours, days and dates. Directions: Directions: From Connecticut Turnpike: Clinton exit 63 onto Route 81.From Saybrook, turn right off connector onto Route 81, and at next light turn left onto Glenwood Road (across from commuter parking lot), proceed to third stop sign (next to firehouse), turn right and come straight for 1.2 miles to second tree farm on left. Driveway is on the right between the old red Cape farmhouse and the barn. Parking is in front of the stone wall, or in the yard. From Madison, take exit 63, left off the connector to light, turn left again to next light, and make immediate right onto Glenwood Road, and follow the instructions above.. Payment: Cash, only. We grow the traditional Christmas tree---the short needle White Spruce. All trees, regardless of size, are one price--$40, the same as previous years. NOTE: I replaced the link to their website with their Facebook page in December 2018 - Norton AV identified it as malware. 190 Little Lane, Durham, CT 06422. Phone: (860) 685-1678. Email: timdumas@comcast.net. Open: from Friday after Thanksgiving at 9 am to 4:30 pm, then that Saturday and Sunday as well, 9 to 4:30 pm; Hours the following week are 12 pm to 4:30 pm on Thursday and Friday, 9 am to 4:30 pm Saturday and Sunday. 166 Lake Drive, East Hampton, CT 06424. Phone: 860-267-4159. .Email: hazentreefarm@gmail.com. We offer cut your own white spruce for $48 including tax (2018). They are beautiful tress and a great deal. Enjoy the experience with your family this year and cut down your own tree for the holiday season. 310 Maiden Lane, Durham, CT 06422. Phone: 860-349-1275. Phone: 860-349-3373. Email: herzigtreefarm@gmail.com. Open: Thursday, Friday, Saturday, and Sunday; Starting November 23rd thru Sunday December 16th on Thursday and Friday in December 1:00 PM to 5:00 PM; Saturday and Sunday 9:00 AM to 5:00 PM. Directions : Herzig Family Tree Farm is located on Maiden Lane in Durham, 1 1/4 miles off Main Street (Route 17). Follow the signs. This is a small family business offering personal and friendly service. You choose and we will do the rest. Cut, Carry, Net and Tie. Free candy canes and stickers for the kids. - Do the Hill! Payment: Cash or Check ONLY . 614 Bow Lane, Middletown, CT 06457. Phone: 860-346-4680. Phone: 860-346-0710. 57 Plains Road, Deep River, CT 06417. Phone: 860-526-5052. Email: joestreefarm54@gmail.com . Open: 9 pm to 5 pm. Directions : 1 mile West of Exit 5 off Route 9 on Route 80. Open: Friday, Saturday, and Sunday Thanksgiving til Christmas.We also sell small potted trees, Garland and Worlds Best Tree Stands we have 4 acres, flat clean lawn like, paved driveway through middle of farm. U-cut or ask us, curb service, pick out tree without leaving your car if you wish. Refreshments on weekends. Family friendly Christmas tree farm! Cut your own. Complementary tree wrapping. Wreaths, greens and holiday decorations available. Complementary hot chocolate, hot dogs, marshmallows and cookies. 299 Cox Road, Portland, CT 06480. Phone: 860-342-2117. 26 Daly Road, East Hampton, CT 06424. Phone: 860-267-9644. Email: lostspringfarm@sbcglobal.net. Open: Saturdays and Sundays 9 am till Dark. Directions: From Route 66: to Route 196 in East Hampton. Turn onto Route 196 and go 1/2 mile to Flanders Road on Left. Turn onto Flanders Road and stay on it till end. Turn right onto Daly Road, farm is on left. From Route 16: to Smith Street. Follow Smith Street till end. Turn right onto Flanders Road and stay on it till end. Turn right onto Daly Road, farm is on left. approximately 5 miles, take right onto Pent Road. At end of Pent Road take a right onto Tri Mountain Road. Farm is 1.5 miles down Tri Mountain Road. Payment: Cash and Check Only. Wreaths, decorated wreaths and sprays, roping, ornaments, tree stands, and tree waterers. You-Choose and You-Cut varieties: Frasier Fir, Cannan Fir, Blue Spruce, & Norway Spruce. 42 Morris Hubbard Road, Higganum, CT 06441. Phone: 860-345-8060. Email: thomas_v_negrelli@sbcglobal.net. Directions : Route 81, 97 Brault Hill Road. Open: First from the weekend in December, Monday thru Friday 3 pm to Dark; Saturday and Sunday 9 am to 4 PM. Coleman Road, Middletown, CT 06457. Phone: 203-453-0030. Email: e_ojones@msn.com. . Open: Saturday before Thanksgiving at 10 am, then after Thanksgiving Wednesday, Thursday and Friday 12 pm to 4 PM; Saturday and Sunday 9 AM to 4:30 PM. Directions : Farm located just off (east of) Route 17 halfway between Middletown and Durham. Entrance at 400 Coleman Road, Middletown. Look for road signs. No Dogs allowed. Click here for a link to our Facebook page. 31 So. Main Street, East Hampton, CT 06424. Phone: 860-267-8527. Email: donmartin@prodigy.net. 118 Clark Hill Road, East Hampton, CT 06424. Phone: 860-267-4341. Email: peacefulhill@sbcglobal.net. Open: Monday closed, Tuesday to Sunday 10 am to dark. Directions: Click here for a map and directions. Payment: Cash, Check, Debit cards, Visa/MasterCard, Discover. You-Choose and You-Cut varieties: Blue Spruce, Canaan Fir, Colorado Blue Spruce, Douglas Fir, Eastern White Pine, Grand Fir, Noble Fir, Nordmann Fir, Scotch Pine, Turkish Fir, White Fir (Concolor Fir), White Spruce, and other varieties (call!). 59 Cowhill Road, Clinton, CT 06413. Phone: 860-227-2950 . Email: admin@schremppstreefarm.com. Open: Monday to Friday 10 am to Dusk Saturday to Sunday 8 am to Dusk. Directions: From the West (New Haven) I-95 N toward New London Take exit 63 toward Clinton/CT-81 (0.2 mi) Turn left at N High Street (184 ft) Turn left at CT-81/High Street (signs for Killingworth/Haddam/CT-81) Continue to follow CT-81 (0.5 mi) Turn left at Walnut Hill Road (0.4 mi) Sharp left at Cow Hill Road (0.5 mi) Tree Farm will be on your right. Click here for a map and directions. Open the day after Thanksgiving through Christmas Eve. Payment: Cash, only. No tagging. Come on over and walk our gorgeous fields with thousands of beautiul christmas trees. Choose your perfect tree. Cut it down and take it home. We will even wrap the trees up so it is easier for you to get it home and in the stand. Come and see us! You-Choose and You-Cut varieties: Balsam Fir, Blue Spruce, White Fir (Concolor Fir), Fraser Fir, White Fir (Concolor Fir), White Spruce. 278 Town Street, East Haddam, CT 06423. Phone: 860-873-9774. Email: staehlys@att.net. Open: after Thanksgiving through December 23 on Monday, Wednesday through Friday from 12 PM to 4 PM; Saturday and Sunday from 9 AM to 4 PM; Closed Tuesdays; Please visit our website or call for current hours. Updates: Click here for updates. Directions: And for a map to our farm, click here. Christmas Trees: November (After Thanksgiving) through December. Payment: Cash, Check, Visa/MasterCard, Discover, AmEx. You-Choose and You-Cut varieties: Balsam Fir, Blue Spruce, Canaan Fir, White Fir (Concolor Fir), Douglas Fir, Eastern White Pine, Fraser Fir, Scotch Pine, White Fir (Concolor Fir), White Pine, White Spruce. You Choose and We cut varieties: Balsam Fir, Blue Spruce, White Fir (Concolor Fir), Douglas Fir, Fraser Fir, Scotch Pine, White Fir (Concolor Fir), White Pine, White Spruce. 132 Moose Hill Road, Oxford, CT 06478-6117. Phone: 203-888-0322. Open: weekends from 9 am to 5 pm; call for weekdays. You can choose and cut your own Christmas tree. Special prices on 6-7 foot Red Pine or Scotch Pine Christmas Trees: Pines Only $34.99! In December, other varieties become available. 500 So Meriden road, Cheshire, CT 06410. Phone: 203-272-8243. Fax: 203-272-8674. Email: ks@bishopfarm.necoxmail.com. Open: UPDATE for 2018: They are closed indefinitely, We do not know what the new owners plans are as far as opening, and this page is no longer a page for an open business at this time. Directions: Rt 84 to 691 exit 3 south on route 10 left onto route 70 1 and a half miles on right. And for a map to our farm, click here. Our products are usually available in August, September, October, November, December. Payment: Cash, Check, Visa/MasterCard, Discover. 1415 Marion Road, Cheshire, CT 06410. Phone: 203-272-4772. Email: ellenmckinley20@yahoo.com. Open: UPDATE for 2018, Their website is gone; Does anyone have current information, are they still in business and open? If so, please write me, their last reported hours were Day after Thanksgiving then weekends only through December 20th, 9 am to 4:00. Directions: Route 84 East, exit 26 - (Route 70 - Cheshire) right off exit. At first light go left onto Marion Road. Tree farm is 7/10's of a mile on the left. (Through the stop sign, 3rd house on left). Drive up hill to the Giant Snowman. From New Haven Route 10 North, through the center of Cheshire. Just past the center the police station will be on your right. Three quick lights from the police station turn left onto Jarvis Street. Follow Jarvis Street all the way to the end. Turn right onto Marion Road. The Tree Farm is 3/10's of a mile on left. Drive up the hill to the Giant Snowman. 680 Evergreen Avenue, Hamden, CT 06518. Phone: 203-288-1026. Email: info@brokenarrownursery.com. Open: daily; see our website for hours. Click here for current open hours, days and dates. Directions: See our website. Click here for a map and directions. Payment: Cash, Check, Visa/MasterCard, Discover, AmEx. Click here for our Facebook page. 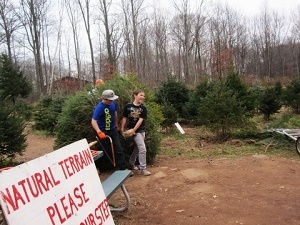 Over 20 acres of trees at two locations in Hamden - 2011 is our 65th year of growing Christmas trees. We are known for our unique hand-crafted wreaths made with unusual and traditional greens. You-Choose and You-Cut varieties: Balsam Fir, Colorado Blue Spruce, Douglas Fir, Eastern White Pine, Fraser Fir, White Fir (Concolor Fir), White Spruce. Broken Arrow Nursery - Broken Arrow Road - Christmas trees-you choose and you cut, Precut Christmas trees, Living Christmas trees (to plant later), Christmas wreaths, Christmas boughs, garlands, Santa appearances, trees tied, tree shaking provided, trees baled, saws provided, info@brokenarrownursery.com. Open: Every day; see our website for current hours. Click here for current open hours, days and dates.. Directions: See our website. Click here for a map and directions. Payment: Cash, Check, Visa/MasterCard, Discover, AmEx. Click here for our Facebook page. Over 20 acres of trees at two locations in Hamden - 2011 is our 65th year of growing Christmas trees. We are known for our unique hand-crafted wreaths made with unusual and traditional greens. You-Choose and You-Cut varieties: Balsam Fir, Canaan Fir, Colorado Blue Spruce, Douglas Fir, Eastern White Pine, Fraser Fir, White Fir (Concolor Fir), White Spruce. Living, rooted tree varieties: Colorado Blue Spruce, White Spruce. 1559 Peck Lane, Cheshire, CT 06410. Phone: (203)-500-9288. Fax: (203)-271-1904. Email: dawncestaro@gmail.com. Open: Friday, Saturday and Sunday from 8 am to 6 pm, November 26 to December 23. Directions: The farm is conveniently located minutes from Exit 26 on I-84 and Exit 3 from I-691. Click here for a map and directions. Payment: Cash, only. Cheshire Hollow Farm is a working 100 acre farm in the north end of Cheshire, Connecticut. Aside from fresh-cut Christmas trees, our farm also holds birthday parties for kids ages 3-9 at our indoor/outdoor party facility, "The Birthday Barn". Additonally, the farm is available as a destination for school field trips. 185 Elm Street, Guilford, CT 06437. Phone: 203-457-0200. Email: rworph@gmail.com. Open: 9 am to 4 pm the day after Thanksgiving ,1 pm to 4 Pm weekdays and 9 am to 4 pm on Saturdays and Sundays until sold out. Directions: 1/2 mile North of the route 80/77 intersection. Just follow the red and yellow signs. Click here for a map and directions. We open the day after Thanksgiving. We do not use pesticides on the crops. Payment: Cash, Check. You can enjoy your hotcider and candy cane in our rustic cabin with a wood stove. or at the picnic table. Our plantation is easy to walk and dogs are allowed if on leash. No chainsaws allowed. We provide twine for tying tree on or in vehicle. 235 Talmadge Road, Cheshire, CT 06410. Phone: 203-272-6921. Open: Beginning the day after Thanksgiving; Open Friday, Saturday and Sunday from 8 am to 5 pm. Directions: Click here for a map and directions. Payment: Cash, Check. Come and have fun choosing your Christmas tree. The tree will then be baled by us. Blue Spruce, Fraser Fir and Con-color Fir. You-Choose and You-Cut varieties: Blue Spruce, Fraser Fir. 440 Hulls Hill Road, Southbury, CT 06488. Phone: (475) 212-5440. Email: info@drumlinhillfarm.net. Open: 9 am to 4 pm pm every weekend from the day after Thanksgiving to Christmas Eve. Open: Click here for current open hours, days and dates. Directions: Click here for a map and directions. Payment: Cash, Check, Debit cards, Visa/MasterCard. Click here for our Facebook page. Santa is coming and you can hang out with him on one Saturday, usually in early December from 12 pm to 2:00 pm. There will be tons of photo opportunities with the big guy and around the farm among the trees! Come visit us Fridays, Saturdays and Sundays, starting Friday, November 25th to pick out and cut the perfect tree to decorate for Christmas. We supply the saw and will bale your tree for transport. We even provide local delivery for you. 208 Kirk Road, Hamden, CT 06514. Phone: 203-248-8955. Email: JoeAntVig@aol.com. 532 New England Lane, Orange, CT 06477. Phone: 203-795-5052 . Alternate Phone: 203-410-5117 . Fax: 203 795-8573. Email: lge1726@gmail.com. Open: all weekends from Thanksgiving to Christmas from 9 am to 4 pm. Directions: follow the white and red arrows that say Lou's xmas tree farm dogwood road in orange to Russell Avenue to new England Lane or Racebrook Road to Russell Ave. Click here for a map and directions. Payment: Cash. beautiful walking farm on manicured lawns surrounding three ponds. We have 5 fields, including one new field. We specialize in a wide range of tree sizes from small to large trees; 3 ft to 25ft tall, for cathedral ceilings. All trees are $60. We are able to cut and load your tree for an additional ten dollars. Click here for our Facebook page. You-Choose and You-Cut varieties: Blue Spruce, Colorado Blue Spruce, Douglas Fir, Fraser Fir, Norway Spruce, White Spruce. 375 State Street, Guilford, CT 06437. Phone: (203) 458-9389. Alternate Phone: (203) 885-6885. Email: pinchbeckstreefarm@gmail.com. Open: Saturdays and Sundays, from Thanksgiving to Christmas, from 9am to 4 pm. Directions: 1/2 mile north of Boston Post Road. Follow State Street under the highway overpass. Our farm is on the right at the crest of the hill. 375 State Street, Guilford CT. Click here for a map and directions. We do not use pesticides on the crops. Payment: Cash, Check, Visa/MasterCard. Family run choose and cut tree farm located in downtown Guilford. All choose and cut trees are $50. Start a family tradition at our farm! Free hot cider, cookies, and hay rides. U-Choose and Cut varieties: Canaan Fir, Colorado Blue Spruce, Fraser Fir, Grand Fir, White Fir (Concolor Fir), White Pine, White Spruce. PreCut varieties: Canaan Fir, Colorado Blue Spruce, White Fir (Concolor Fir), Fraser Fir. 1127 Main Street North, Southbury, CT 06488. Phone: 203-264-6732. Email: benjaminstiles@aol.com. Open: Day after Thanksgiving to Christmas, 9 am to 4:30 Weekends and 12:30 to 4:30 Weekdays. Ragland Farm and the adjoining land has been in the Stiles family since the late 1600's. We produce Maple Syrup and raise Christmas trees. We also grow vegetables and flowers in the summer which we sell in our small farm stand on the road side. Along with eggs from our 6 beautiful chickens. Maple syrup is available all year round. Christmas trees are for sale from Black Friday until Christmas Eve. The farm stand will be stocked as the supplies grow. We are conveniently located on Route 6 so stop by for a visit! 21 Broken Arrow Road, Hamden, CT 06518. Phone: (203) 288-2796. Alternate Phone: (203) 430-6124. Email: efchoffman@comcast.net. Open: from November 23rd to December 24th; Weekdays from 12 pm to 4:30 pm; Weekends 8:30 am to 4:30 pm. Directions: "Lost In The Woods" at the end of Broken Arrow Road. Click here for a map and directions. Payment: Cash, Check. Click here for our Facebook page. We have saws and we do not charge for baling. We're sorry to say that we do not have restroom facilities. Large trees, $40-$55 2018 price). U-Choose and Cut varieties: Blue Spruce, White Spruce. 767 Derby Milford Road, Orange, CT 06477. Phone: 203-795-6829. Email: sabrina@sunflowerfarm.com. Directions: Merrit parkway to Exit 56 in Orange, to Turkey Hill Road, to Derby Milford Road. Or Route 34 to Derby Milford Road.. And for a map to our farm, click here. Our products are usually available in November, December. Open: Monday through Friday 12-6, Saturday and Sunday, 10-6. Christmas trees, beautifully decorate wreaths, handmade grave baskets, handmade and decorated porch and patio pots, beautiful little shop with fresh handmade soaps and cosmetics, gift items, local raw honey, local maple syrup and so much more. Payment: Cash, Check. Click here for a link to our Facebook page. 65 Mill Road, North, CT 06471. Phone : 475-777-6832. EMail : totokettreefarm@gmail.com. Open: Please check out our facebook for seasonal hours. Directions : From points North; Take 91 South to exit 8 for CT-17/Middletown Avenue towards CT-80 North Branford, Use left two lanes to turn on to CT-17 North Middletown Avenue. Continue straight on CT-80 East/Foxon Road for 3.7 miles. Turn left onto Totoket Road. Turn right onto Mill Road. Destination will be on the right. From points South Take exit 54 off I-95North, left two lanes to turn left onto Cedar Ctreet, Continue straight to stay on Totoket Road, Turn right onto Mill Road, Destination will be on the right. Click here for a link to our Facebook page. 361 Old Tavern Road, Orange, CT 06477. Phone: 203-799-2453. Email: info@treatfarm.com. Open: Saturday after Thanksgiving to December 21 on Weekends 9 am to 5 pm,. Directions : Exit 41 off I-95 North or South - At end of exit ramp, take Marsh Hill Road toward and across Route 1/Boston Post Road (Marsh Hill Roard becomes Lambert Road). Take first left onto Old Tavern Road. Farm is 1.2 miles down on the right. Exit 56 off Wilbur Cross Parkway/ Route 15 South - At end of ramp, take a right onto Grassy Hill Road. At first light, take a left on Old Grassy Hill Road, right on Orange Center Road (Route 152), right on Old Tavern Road. Farm is 1.2 miles down on the right.We have a large selection of decorated and undecorated wreaths, swags, cemetery pieces, and roping. Custom wreaths also available. Cash and check only, no credit cards. Early tagging of trees beginning in November. Not ready to take your tree home just yet? Feel free to stop by and tag a tree, which will "hold" it for you until you are ready to cut it down and take it home. All tagged trees must be cut by Saturday, December 21st, unless other arrangements are made. For safety reasons, we cannot allow power saws of any kind. We have a number of handsaws available for your use. We will be happy to trim stray branches and bale your tree if you would like us to. We are not responsible for transporting or tying your tree to your vehicle. We have twine available for securing your tree, but strongly suggest that you bring whatever items you might need to properly secure your tree. Pets are permitted at the farm, but must be on a leash and under your control at all times. Pets are not permitted in any indoor sales areas. We do not have public restrooms at the farm, so please plan accordingly. Click here for a link to our Facebook page. 51 Valley Road, No. Branford, CT 06471. Phone: 203-488-2110. Email: info@vanwilgens.com. Open: Monday to Friday from 8 am to 5 pm; Saturday and Sunday from 8 am to 5 pm. 15 Acre Choose and Cut Christmas Tree Field. In 2016, Any Choose & Cut Tree in our field is $65. Every year it's a treat to see families make you memories in our tree fields. We recently added 3,000 little Fraser Fir seedlings to the huge hill you see from the garden center. Every year we spend time carefully pruning our trees so they have the best shape possible. Our tree field has a selection of Fraser Fir, Douglas Fir, Blue Spruce and Turkish Fir, in a variety of sizes we know you find just the right one! The train is back! It will be ready to ride December 3rd. fun for the whole family. Santa will be here usually on the first weekend in December from 11 am-2pm. When you do we are here to make sure that it's cut, wrapped up and secure for the ride home. Our staff is here to help. 5501 Paradise Avenue, Hamden, CT 06514. Phone: 203-288-5545. Open: 8 am to 5 pm,. Directions : Exit 60 off the Merit Parkway - North on Dixwell Avenue to left on Skiff Street at Mart Shopping Center - travel West 1 mile to Paradise Avenue.